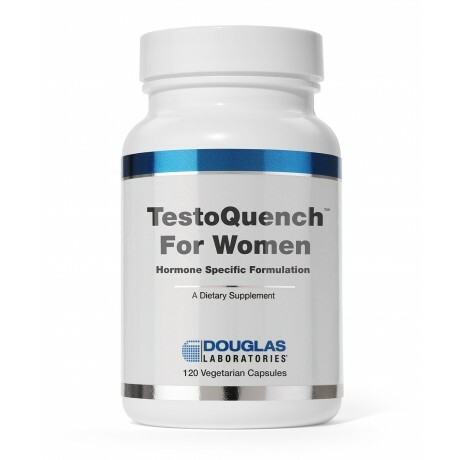 TestoQuench™ for Women is a synergistic combination of phytoantiandrogens that is designed to restore a healthy hormone balance by supporting the optimal function of testosterone-sensitive tissues. Phytoantiandrogens are a class of phyto-compounds that decrease tissue sensitivity to androgens or reduce androgen activity. They function predominantly by inhibiting the action of 5-alpha-reductase, which decreases the conversion of testosterone to the more androgenic dihydrotestosterone (DHT). As a dietary supplement; adults may take two capsules each day with food for one to two weeks or as directed by your healthcare professional. The dose may then be increased to four capsules per day with food for two to four months or as directed by your healthcare professional. After two to four months the dose can be reduced. Other ingredients: Hydroxypropyl methylcellulose (capsule), cellulose, vegetable, and silica. This product contains NO yeast, wheat, gluten, soy protein, milk/dairy, corn, sodium, sugar, starch, artificial coloring, preservatives, or flavorings. Not to be used by pregnant or nursing women. Keep out of reach of children.